Although you can’t tell by walking outside, spring IS coming!! We promise! We’re working on a few projects right now that will fit right in with your early spring wardrobe. 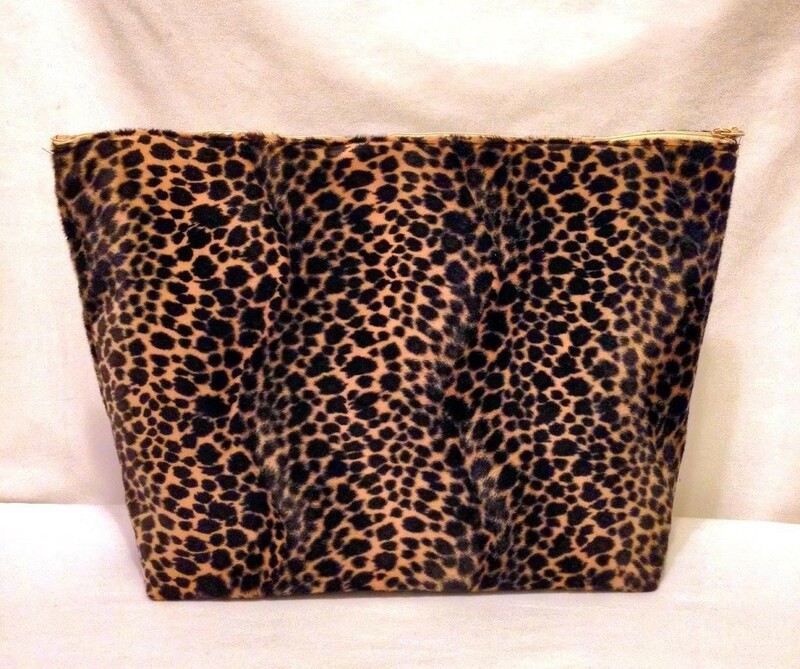 First up, we’re feeling a little feisty with this animal print purse in progress. Will it stay a clutch? Leather straps perhaps? Jeweled brooch? Email us and let us know what you think, or post your suggestions on Facebook at armcandykc@gmail.com or www.facebook.com/armcandykc ! 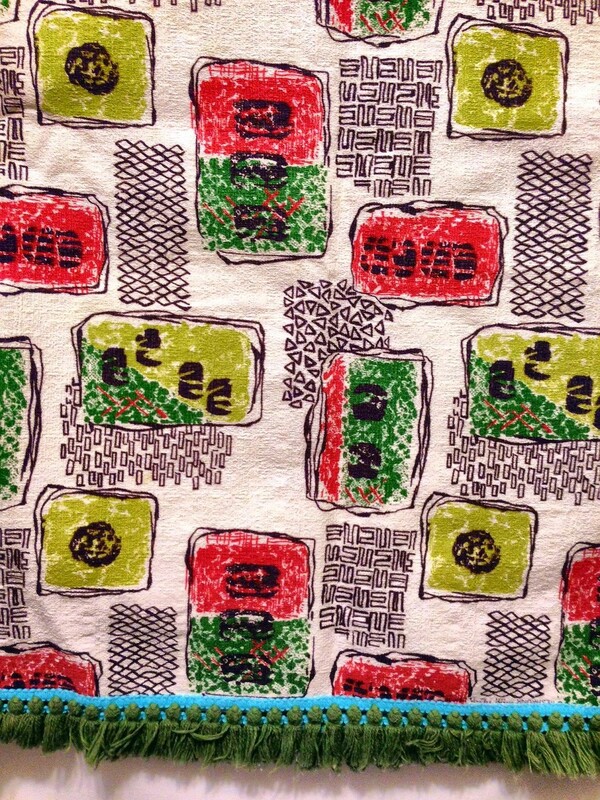 Now for a little vintage fabric lovin’! If you are a vintage lover like us, you know that finding a gem like this is a pearl beyond price. Great color variation, texture, and look at that hem!! This fabric was found at a little store just outside of Kansas City, and our minds are racing with ideas of accessories to make! We’ll post the finish product ASAP! Have fun, and stay warm out there! Don’t forget to check back next week for some updates to the Shop page, the Square Market, and Facebook!!! Baby, it’s cold outside! So why not stay warm with a little added sparkle? 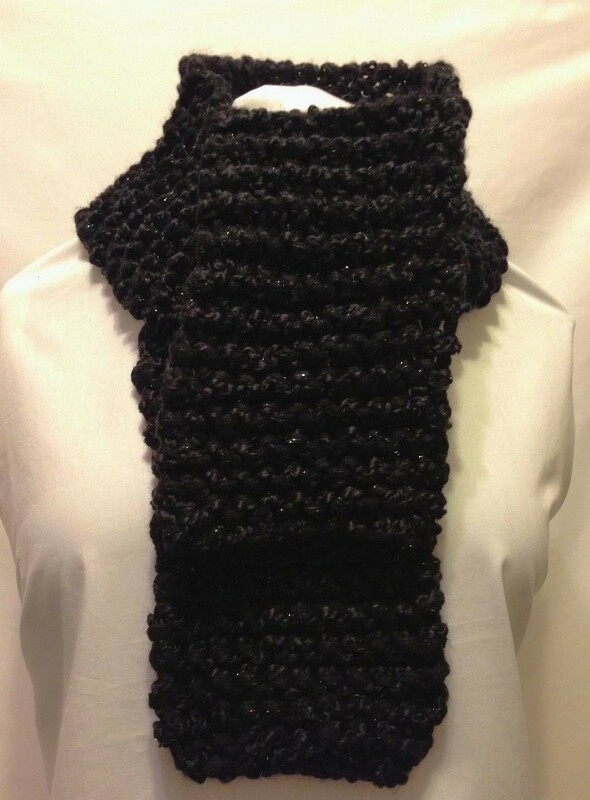 Made by knitting two yarns together as one, this super chunky, super cozy, dash of glam scarf will keep you toasty while you consider packing up your house and moving to Bora Bora where the winter low’s are in the 70’s. Keep the faith, and a bottle of Irish Creme, because spring is coming, but today calls for a dynamite sweater/ scarf combo! Follow the sparkle right into Hickory Dickory, February 7-9, where this piece can be found. If it is calling your name, please email us or message us on facebook and we will get this item shipped to you ASAP! As ever you can pay safely and securely with PayPal or the Square Reader! Have a great week, and stay toasty! Welcome to your first Sneak Peak Tuesday of the year! This corseted scarf is hot off the presses (or needles) and we just had to share. It’s made out of lusciously soft worsted wool, so it doesn’t itch and looks great under a coat of any color. Simply button this little lady up, and fold the top over the collar of your existing coat for a little black and white flare! The grommets and tie make it one neck fits all, so if you are still in the giving spirit after the Holidays, have no fear, it will fit! Our little (perfectly manicured, of course) fingers have been flying over knitting needles lately, so we’ll definitely keep you posted on more colors and prints that we invent in this style and look for this and others soon in a HUGE update coming February 1! !